Seeing penguins at the zoo is always a fun and unforgettable experience. Going to see them flock in the Antarctic is even better. But you can bring home a Stuffed Gentoo Penguin 12 Inch Plush Animal by Fiesta of your very own without having to leave home. Measuring at the convenient size of twelve inches, this gentoo penguin stuffed animal is the perfect size to take with you on all of your adventures. Unlike real penguins straight from the rookery, warm weather doesn't bother this plush gentoo penguin. Car rides to the beach? No problem! With its soft, durable plush fur and realistic features, this gentoo penguin stuffed animal is sure to liven up any party. But why settle for just one? 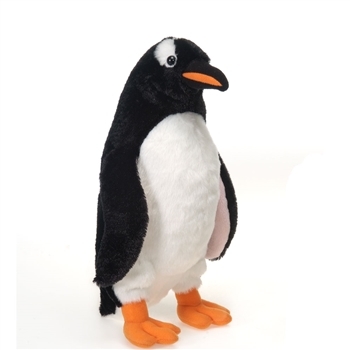 At such an affordable price, the Stuffed Gentoo Penguin 12 Inch Plush Animal by Fiesta will serve as an excellent party favor. You can rest assured every child will appreciate a gentoo penguin stuffed animal of their very own. For over 40 years, Fiesta Toy has been one of the world leaders and innovators in stuffed animals and plush toys. Their wide assortment of traditional and unique stuffed animals inspires creativity and imaginative play. Fantastic products like this gentoo penguin stuffed animal allow children to share in the magic of the animal kingdom and learn more about the fascinating creatures that inhabit and share our planet. The Stuffed Gentoo Penguin 12 Inch Plush Animal by Fiesta is made with all new, child safe materials and meets or exceeds all U.S. safety standards. Recommended for ages three and up, we suggest surface washing for this plush gentoo penguin. Bought this stuffed penguin for my daughter and she loves it. It's the softest stuffed animal I've ever seen. It is really well made and easy to clean. It has a real "personality" in its look and will certainly bring joy to anyone getting it! Really happy I made this purchase!